Slide 6: Another view of Seminar participants in session. 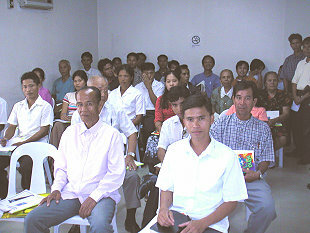 Prior to arriving in the Philippines Pastor Henry wrote a condensed Manual of Procedure for the Seventh Day Baptist Churches in the Philippines. During each lecture he would teach polity from their Manual of Procedures. The goal was for them to learn the principles of polity and then revise the Manual of Procedure to fit their understanding and organization of the church. President-Rev. AlB. Paypa, 2nd Floor Aznar Bldg., T Padilla Street, P.o.Box 940, Cebu City 6000, Philippines. Vice President-Pastor Sabino Bucay, Parasan, Molave, Zambo, del-sur.